I received this product in one of my subscription boxes. Though I was very excited to try it, I had other products to finish first. So when a spot opened up in my beauty routine, I eagerly started using it. 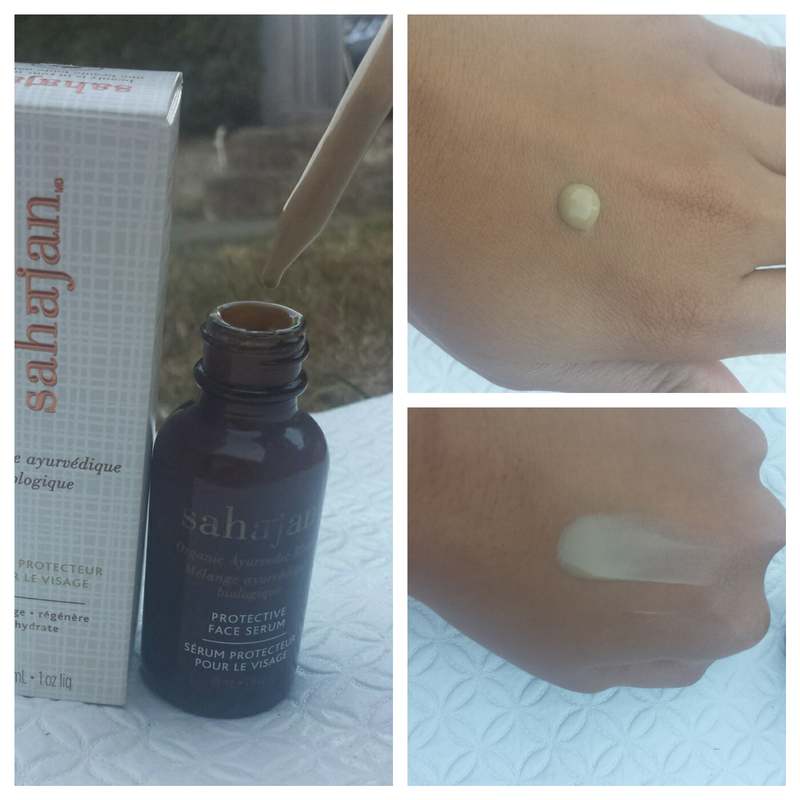 So here is my full review of the Sahajan Protective Face Serum. 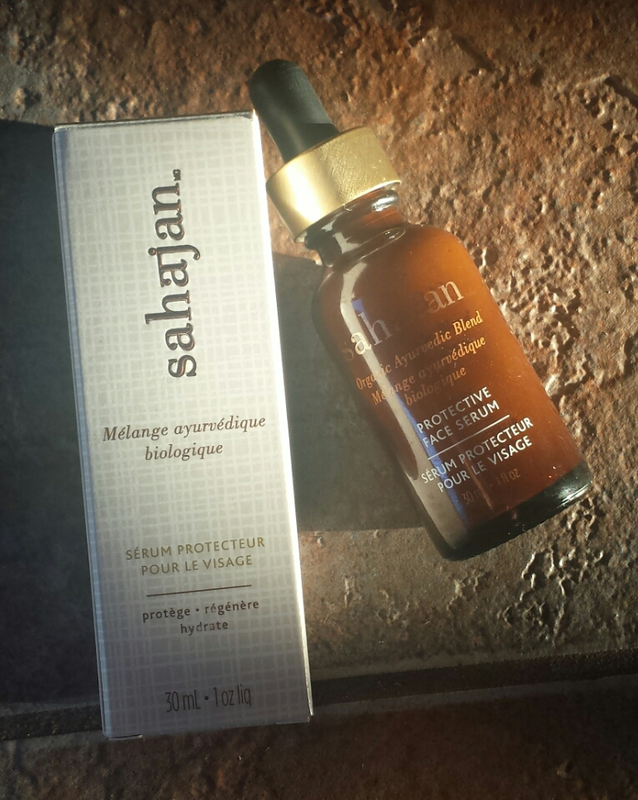 Sahajan Skincare is a new Canadian brand that has a unique approach to beauty- it is a fusion of Ayurvedic remedies and organic science. A way to heal and nourish hair and skin, without worrying about the ingredients. Sahajan is a Hindi word meaning intuition. The founder of Sahajan Skin Care, Lisa Mattam started this line of products after finding her toddler putting her beauty creams all over her face. Worried about what was actually in the creams and what was going on her daughter’s face, she wanted to create products with organic and natural ingredients for body and hair. 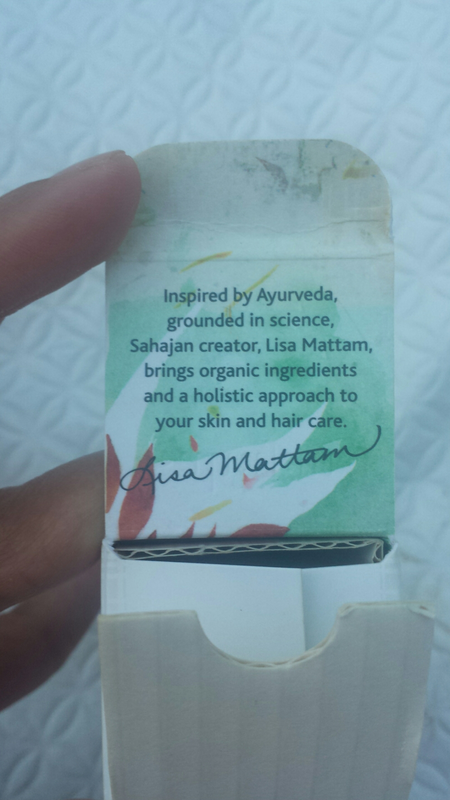 Sahajan was inspired by Lisa Mattam’s traditions from back home – Kerala in Southern India which is rich in Ayurvedic traditions. Ayurveda is simply the “science of life” , a 5,000 year-old system developed in ancient India and used in over 80% of households today.Ayurveda embraces the spiritual, mental and physical aspects of health while seeking to balance the heart, body and mind, using plant-based medicine, diet, yoga, and meditation. Oils are a huge component of Ayurveda, and these Ayurvedic oils play a crucial role in the Sahajan Skincare product line. Lisa worked with a team of scientists in Canada to formulate the products with the assistance of Ayurvedic doctors in India.Ayurvedic medicine has developed natural – and delicious – ways to nourish the skin. The Protective Face Serum (50 ml / $70 CAD) is a silky rich serum that’s full of beneficial antioxidants such as – Coconut Oil which nourishes and hydrates, while Honey helps repair the delicate skin around the eyes. Triphala, a powerful antioxidant blend of three fruits, helps to brighten skin’s appearance. Neem Oil is prescribed in Ayurveda as a way to reduce inflammation and signs of tiredness.Gotu Kola is a medicinal herb that reduces the appearance of wrinkles, firms the skin and improves skin elasticity. Hyaluronic Acid hydrates and plumps the skin, revealing that youthful glow. The serum has a gorgeous and luxe yet gentle scent.The scent includes a natural accord of soft woody Cedarwood, East Indian Sandalwood Oil with traces of exotic warm Cinnamon Spice, Bold Geranium and soothing Lavender Oil topped with Fresh Bergamot plus Lemon, Lime and Orange Oils.The scent is very natural and not oppressive, and disappears as the skin absorbs the products. The serum is a rich creamy brown shade. At first I did not like the color of the serum.As you can see in the photo, the color is not the typical white or clear colour, but beige/brown. It may look like expired or old but it is actually the true colour of all the natural products being used. I absolutely loved this earthy scented serum. It is quite thicker than an average serum but this would be great during the winter months. It absorbed very quickly into the skin, despite being thick, leaving a glowy complexion. I did not experience any skin irritations or breakouts.The price point is mid to high, but the products are all rich and highly concentrated so a little goes a long way and will last several months.